Create a green sailing boat from stored nanites. Green Boat Controller is a vehicle controller used to summon a Green Boat. The boat can move quickly over water. 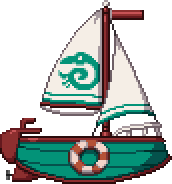 It is a reference to the ship from Treasure Adventure World, "The Glooskap," to which it is identical. This page was last modified on 3 August 2016, at 05:37.